It is another year and another session of the UN General Assembly. We meet in the same assembly hall and deliver our addresses from the same podium. Yet, no modicum of protocol can mask the gaping divide in our ranks. We live in an increasingly fragile, unjust and unequal world. A small minority holds the reins of power and wealth between nations and, for the most part, within nations. The overwhelming majority of nations and their citizens are without power, without voice, without the means for a decent life, and often without peace and security. We may be called the United Nations, but the reality is that we are divided nations and societies. Despite our deep divisions, however, our destinies are inter-twined in a fundamental way. We share a common home, a small planet in a vast universe, a tiny boat in a vast ocean. Whatever calamity happens anywhere in our world epidemics, poverty, violence, mass displacement, war, terror- it will eventually catch up with all of us. We share responsibility to address the fundamental problems of our common world. Certainly, the mighty and wealthy should shoulder bigger responsibility as they command vast power and resources. It is only fair that more is asked from those to whom much has been given, or more accurately, those who have appropriated much for themselves. We should unflaggingly remind them of their obligations and press them, not for charity, but for enlightened self-interest that understands that might is not permanent and that only shared benefits are sustainable. We would, however, be gravely mistaken and would have forgotten the lessons of history, if we pinned all our hopes on the goodwill of those who currently enjoy disproportionate power, wealth and influence. Power does not readily concede its privileges of its own accord. It resorts to deception, coercion, pressure, sanctions, violence and war to maintain and if possible increase its privileges. The developing countries and the marginalized peoples of the globe stand to gain most from a more peaceful, secure, just and equal world. They owe it to themselves and to coming generations to build solidarity and to steadfastly strive and work and innovate for a better world. It is their duty to ensure freedom, dignity and prosperity to their peoples. Africa remains the most marginalized of all continents. Undoubtedly, there is some progress, more in some countries than others. But talk of an African Renaissance, of fastest growing economies is misplaced and premature. We should not flatter ourselves, or allow others to flatter us. Africa remains a producer and small-bit exporter of primary products. It retains minimum revenue from this export, with foreign companies getting the lion’s share. Processing of primary products, value-addition, industrialization, technology development barely exist. African economies, physical and social infrastructure, institutional and governance structures, peace and security architectures remain undeveloped. Yet, Africa boasts tremendous human and natural resources; indeed, over 60% of global natural resources lie in Africa. It is only when Africa’s economies, the quality of its infrastructure, the standards of its health and educational institutions, the level of its artistic, scientific and technological products, the effectiveness of its institutions and enterprises, and more importantly the quality of life of its citizens, reflect more accurately its great potential that we can rightly speak of Africa taking its rightful place in the world. We should safeguard independence and sovereignty, fight ethnic polarization and rampant corruption, chart our own paths, develop bold and imaginative policies that suit our conditions, rely mainly on our own resources, and build an Africa that meets the aspirations of its people and makes valuable contributions to humanity. Eritrea is a young nation, strategically located and with significant human and natural resources. It joined the community of independent nations a quarter of a century ago by dint of its people’s long, 30 year long, struggle for freedom and self-determination, fought and won against tremendous odds. As an independent nation, it has faced the full brunt of an unfair and unjust international order. It has faced demonization, ostracization, sanctions and armed aggression. Eritrean people and their government. Eritrea was severely tested. It emerged intact, more determined, experienced, and in many ways stronger. It is peaceful, stable, secure and harmonious, a haven of stability in a turbulent neighborhood. Eritrea is, quietly and without fanfare, engaged in comprehensive nation-building. It is pursuing policies and taking concrete measures to strengthen the unity and harmony of its people, foster their political participation and unleash their energies and talents. It is laying the ground for broad-based and sustainable economic development. It is step by step putting in place modern infrastructure. It is working to ensure that all its citizens get good access to nutritious food, clean water, electricity, shelter, transport, communications, health and educational services as well as cultural, sports and recreational facilities. Eritrea has also embarked on a massive, water and soil conservation, as well as an afforestation program, as part of its comprehensive plan to enhance the environment and fight climate change. 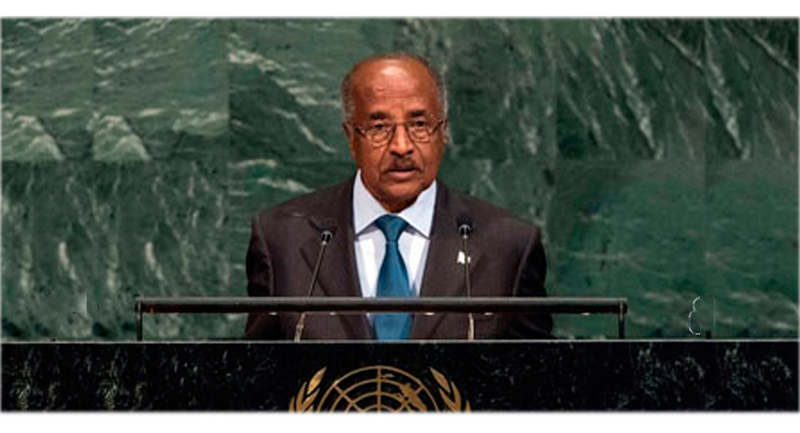 Eritrea is confident it will meet the Sustainable Development Goals ahead of time. encourages cooperation and partnership, with a focus on trade and investment. Eritrea also seeks to make a modest contribution to peace, stability and cooperation in its wider region, which includes the Nile Basin, the Horn of Africa, the Red Sea Basin and the Gulf. It has successfully fought and continues to fight radicalization, extremism and terrorism on its own and in cooperation with its neighbors. Eritrea extends its hands of friendship and solidarity to all peoples and nations who strive to build their countries and contribute to a fairer, more just and equal world. Eritrea takes the initiative to engage with all countries, including those who differ with it. Eritrea strongly believes that its political, economic, social and diplomatic path would be smoother and easier if the external obstacles that have been on its path were removed. It therefore once again calls on the United Nations Security Council to lift the unfair and unjust sanctions imposed on it for the past nine years. There is no justification for them to continue and they do not serve any useful purpose. Another impediment in front of Eritrea, indeed in front of the whole Horn of Africa region, is the 15-year old occupation of sovereign Eritrean territory by Ethiopia. Eritrea calls on the Security Council to ensure the end of this flagrant violation of international law and several UN resolutions.